The family of a seriously disabled boy are encouraging people to dance the night away to raise funds for a charity that has helped them. Oliver Coxon was born with his intestines outside his body, later developing brain damage and cerebral palsy – and almost died during a vital operation when he was just months old. Now aged four, he spent much of the first year of his life in hospital and his parents Stewart and Suzanne provide round-the-clock care for him at the family’s home. 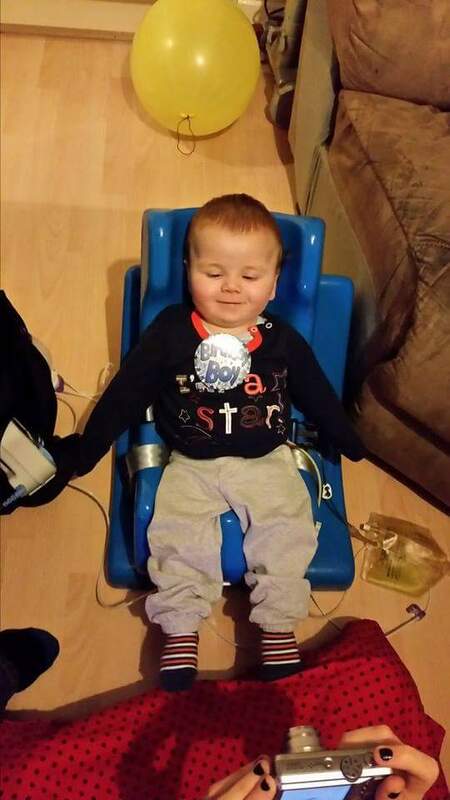 North Wales children’s charity Happy Faces has provided support over the past 18 months, with the latest donation – a specially adapted £700 car seat – enabling Stewart to take him on trips out. The charity will be raising funds at a Ballroom Blitz dance evening, as part of the popular Colwyn Bay Forties Festival, and Stewart is encouraging people to join the celebrations. The family-focused festival, on Saturday April 21 and Sunday April 22, celebrates the town’s strategic war-time role in keeping Britain fed, when the Ministry of Food set up its HQ there. This year’s festival features full-sized replicas of a Spitfire and a Hurricane, with the town invaded by fans of the era, dressed in vintage style or military uniforms. There will be re-enactments of battle skirmishes at Eirias Park on Sunday, April 22 plus displays of military vehicles, Llandudno’s tram and war-time weapons along with heritage tours. Colwyn Bay’s streets will host performances by Forties style performers plus local food producers, wartime ephemera and nostalgia items. Ballroom Blitz, on Saturday April 21, at the Barn in Zip World Stadium in Eirias Park, features DJ Malcolm Murray, vintage singer Clara Bloom and the Ukulele Party Band with Reflections. The festival, the seventh to be held, has been organised by the Bay of Colwyn Business Network and is backed by Bay of Colwyn Town Council, printers Powlsons plus Colwyn Business Improvement District (BID), which is aiming to revitalise the area. 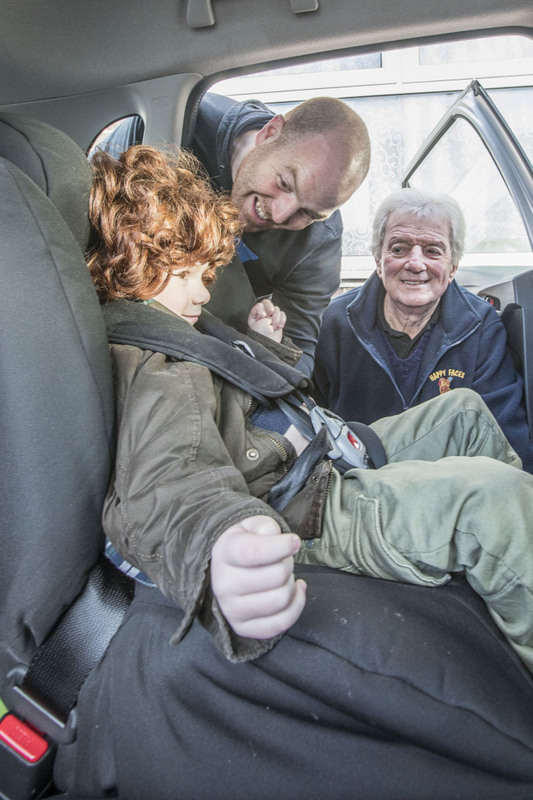 Stewart, who was a supervisor at Cineworld in Llandudno Junction for six years, said: “The car seat is absolutely amazing and it came at the perfect time. Oliver had grown out of the other one so this is much more comfy for him now. He looks like he’s sitting on a throne! “It means that I will able to take Oliver out in the car to events such as the Forties Festival. My dad, who is also called Stewart, will be going along to the Ballroom Blitz dance evening, where a raffle and collection will raise funds for Happy Faces. Colwyn BID project manager Anna Openshaw said: “We are expecting thousands of visitors to the Forties Festival as there will be so much for families to enjoy, all free, on the streets of Colwyn Bay. “For many older people it’s a real trip down memory lane, as they can recall the town when it was taken over by the Ministry. It’s also a real chance for younger people to see what life was like for their relatives. 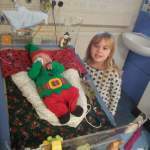 Oliver spent the first ten months of his life in Alder Hey Children’s Hospital in Liverpool, with his parents staying in the Ronald MacDonald House on-site, and big sister Autumn attending a nearby school. Stewart said: “That period was hell for us. It was the worst ten months of our entire lives. “He’s been through more in that space of time than most people go through in a lifetime. “Oliver was born with gastroschisis so basically his intestines and some of his organs were on the outside. “When you’re in the womb your stomach comes together in three parts but that didn’t happen with Oliver. “It was very much touch and go whether he’d survive. He wasn’t breathing at first but once they got him on a ventilator his intestines and organs were wrapped in what was like a cellophane wrap and we were sent to Alder Hey. “He had roughly ten operations in total while he was there. Once he was able to breath by himself we spent three months in the baby unit. Unfortunately for Oliver he suffered a series of infections, which lead to further time in hospital. Stewart said: “There was an issue with his bowels and they wanted to check whether he had Hirschsprung disease – though it turned out he didn’t. However, he bled for three days and almost died. 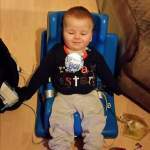 He had to have blood transfusions over the course of a weekend. Having managed to overcome that ordeal, Oliver’s parents were dealt another heartbreaking blow before they finally left Alder Hey. Stewart explained: “By the time he was four or five months he was making some sounds and words but then it stopped. “He couldn’t say anything and became more limp. Sue noticed this and was adamant there was an issue. “She was with him every day as I was still working a couple of days a week back then. She could see something wasn’t right. He wasn’t the same child. “At nine months he had a CT scan which showed that a quarter of Oliver’s brain was missing and he had cerebral palsy. Although the past four years have been tough they have made some progress with Oliver, said Stewart. “It’s hard, you have to watch him all the time. We sleep in the same room as him so we’re there with him constantly. We have to help him eat and change him. Oliver has to be in a wheelchair so you literally have to do everything for him. “But it’s all worth it when you get a smile off Oliver and after months and months of working at it he can say mum and dad, which means the world to us. He’s eating normally too. Stewart senior was so touched by the generosity of Happy Faces that he became a volunteer and is now a member of the committee. The charity was set up by Ray Herbert from Colwyn Bay in 2003 to help sick, disabled and disadvantaged children in the region. The retired 70-year-old, who lives next door to his son in Llandudno Junction, said: “I was at an antique fair and the charity had a table top sale there. I got talking to Ray about Oliver and he offered to put his case to the committee. “My son was with me at the time. Next thing we know we’ve been given a seat for Oliver to put on the floor as he’s unable to sit up by himself. Stewart, who has 12 grandchildren, says the new car seat has been a “lifeline” for Oliver. He said: “When you think of a new car seat you imagine the cost to be around £100. “But because Oliver is severely disabled it’s £700. You can’t afford that kind of money so Happy Faces is a lifeline. The Forties Festival be a trip down memory lane for many of the town’s visitors and residents, from when Colwyn Bay played a key role in keeping war-time Britain fed. The town became home to the Ministry of Food’s HQ with its head, businessman Lord Woolton, setting up his office in Colwyn Bay Hotel on the Promenade. More than 5,000 staff moved to the town, launching campaigns such as Dig For Victory and overseeing the supply of food on the Home Front through ration books. In 1940 the Ministry’s civil servants were moved from Whitehall to North Wales to escape the German bombing raids and free up space in London for the War Office. They requisitioned 38 hotels in the town, including the fashionable Metropole, and The Queens, along with large houses as offices or places to live for the staff. At the Imperial officials monitored ships going into and out of Liverpool. The Ministry’s bread division was based at the Edelweiss Hotel, the bacon and ham division at the Mount Stewart Hotel and the cocoa and chocolate department at the Colwyn Bay Hotel. The workers also took over Rydal School, which was evacuated to the Sychnant Pass in Conwy, and Penrhos College, with pupils moving to Chatsworth House in Derbyshire. The last department – the Bakery Finance Division – left the town on 29 September 1956. This entry was posted in Business, Community, Featured, Health, History, News, Young people. Bookmark the permalink.